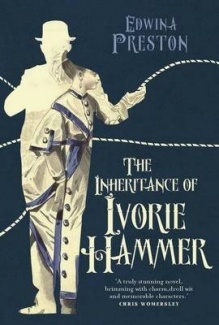 The Inheritance of Ivorie Hammer is seriously good fun. It took me a little while to get into it, but from about page 50 onwards I couldn’t put it down. The story begins high on a mountaintop in a place called Canyon where brothers Arcadia and Otto Cirque arrive with their travelling circus Saturnalia. Sensing a business opportunity, the Madam of nearby Pitch sends some of her – a-hem – ‘girls’ up the mountain, where business indeed turns out to be brisk. One might think such girls would know better, but one of them loses her heart to the flamboyant but heartless Arcadia, and it is Otto, the (literally) silent one, who has to pick up the pieces. Quite how this happens is the heart of a mystery that involves assorted deaths, disappearances, scandals, contortions and contrivances to rival anything you’ll find in Dickens, and yes, there is a stellar cast of unforgettable characters as well. This was the site that the authorities informed them, gruffly, without much cheer: it was here on this large square of ground (rather like a playing field) that they might camp. For the time being. Until better arrangements were made. Senior Sergeant Starlight had given them matches and several kerosene lamps. A stream ran down from the mountains, providing their needs in respect of water, and there was plenty of damp kindling and logs. Otherwise it was not a bad plot of ground at all – a little marshy in places, but flat enough for camping. What’s more, it contained three spare grey structures – they could not be called buildings, for two of them had no walls as such, just roofs, supported on poles, and the third looked more tumbledown than intact. Fortunately for very pregnant Ivorie, she makes the acquaintance of Mrs Po and is delivered of her curious baby in hospital, but there is treachery and betrayal in store for her, not least from the Misses Starlight whose friendship she craves. They are prepared to bestow it only because she is a better class of person than her dubious fellows from Canyon, indeed, surely, her mysterious origins must lie in Pitch, must they not?